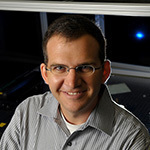 Zachary Schultz, Associate Professor of Chemistry and Biochemistry, has accepted an invitation to join the Features Panel of the journal Analytical Chemistry. The Features Panel suggests scientists and topics to be covered in the journal’s Feature, Perspective, and Review articles. This appointment is for a three-year term beginning in 2016, and the members of the panel are selected to complement the expertise of the journal editors. Research in the Schultz lab endeavors to develop new instrumentation and methodologies to improve the detection and analysis of molecules in complex samples. Often, these samples are relevant to biomedical research. Using laser spectroscopy and spectroscopic imaging modalities such as Raman near-field scanning optical microscopy, identification and quantification of analytes is possible with very high resolution. One area of particular interest in the Schulz lab is utilizing localized surface plasmon resonances in metal nanostructures to enhance the analysis of protein-ligand interactions, which are common drug targets, and to regulate signaling processes in cellular membranes. Schultz has been on the faculty at Notre Dame since 2009, and he has previously been recognized with the Cottrell Scholar Award (2013) and the NIH Pathway to Independence Award (2008). Originally published by Rebecca Hicks at chemistry.nd.edu on January 06, 2016.